The famous Vital Lacerda boardgame comes back in a new edition! 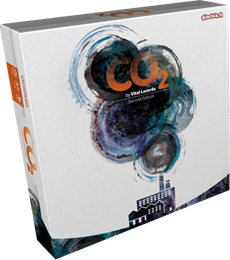 CO2: Second Chance revises and enriches of the original competitive game CO2 published in 2012 and also includes a brand-new cooperative game, in which the players have to collaborate to save the world. In the game CO₂, each player is the CEO of an energy company responding to government requests for new, green power plants. The goal is to stop the increase of pollution while meeting the rising demand for sustainable energy — and of course profiting from doing so. You will need enough expertise, money, and resources to build these clean power plants. Green Power Plants that you've built, UN Goals you've completed, Company Goals you've met, and Expertise you've gained all give you Victory Points (VPs), which represent your Company's reputation — and having the best reputation is the goal of the game … in addition to saving the planet, of course. To learn more about the game, check out it's Kickstarter project, which is currently underway.